A Jewish guy called Jacob finds himself in dire trouble. His business has gone bust and he's in serious financial trouble. He's so desperate that he decides to ask God for help. 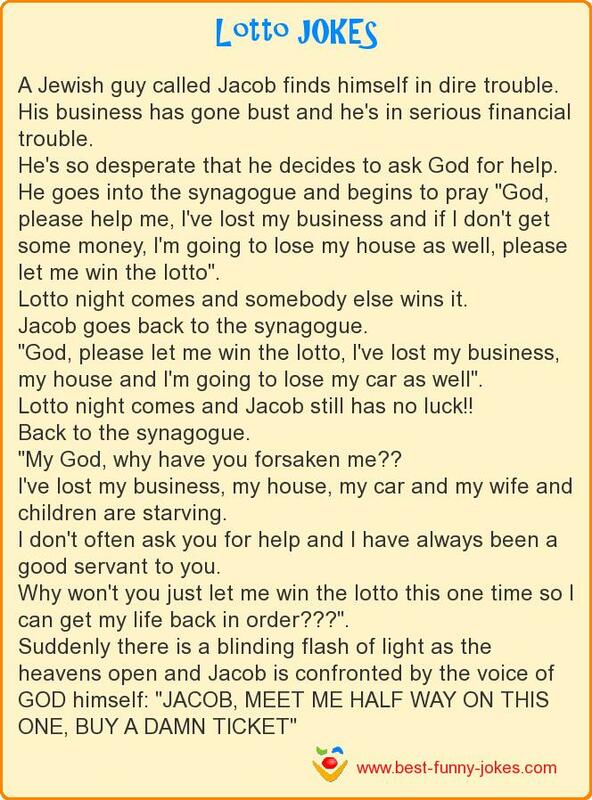 He goes into the synagogue and begins to pray "God, please help me, I've lost my business and if I don't get some money, I'm going to lose my house as well, please let me win the lotto". Jacob goes back to the synagogue. "God, please let me win the lotto, I've lost my business, my house and I'm going to lose my car as well". Lotto night comes and Jacob still has no luck!! "My God, why have you forsaken me?? I've lost my business, my house, my car and my wife and children are starving. I don't often ask you for help and I have always been a good servant to you. Why won't you just let me win the lotto this one time so I can get my life back in order???". Suddenly there is a blinding flash of light as the heavens open and Jacob is confronted by the voice of GOD himself: "JACOB, MEET ME HALF WAY ON THIS ONE, BUY A DAMN TICKET"